Klear Screen contains a unique 3-step liquid polymer-based formula that LIFTS and DISSOLVES surface contaminants and fingerprints, floating debris off the screen surface, leaving an ANTI-STATIC coating which dramatically reduces surface friction & wear, resists fingerprinting and provides a renewable protective screen barrier. 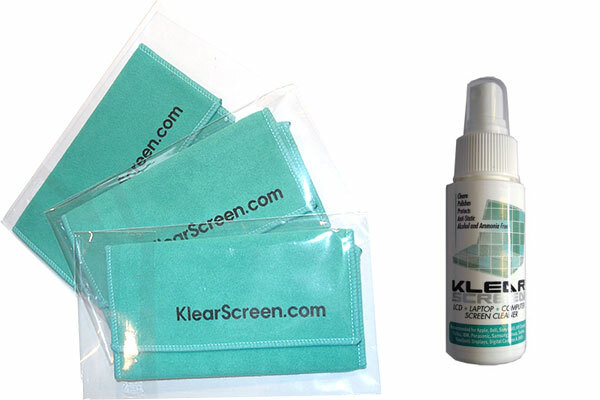 Klear Screen is safe and easy to use, two step process, cleans and protects your console & screen from dirt, dust and fingerprints etc. Klear Screen formula in combination with the new revolutionary microfibre chamois cloth provides high performance polishing and protection of these screens. The Microfibre Chamois cloth is lint free, non damaging, washable and reusable and is long lasting This cleaning combination removes fingerprints, smudges, dust etc from your screen leaving an antistatic protective barrier on the screens.